I guess we would usually start at the start line, but this race has been a lot longer than that. Whether you have followed my footsteps or not, the easiest way to put it is that I have been plagued. By injury. 2013 was a year of battling. Emotionally and physically I was on a roller coaster! From December 2013 to January 2014 I had six weeks off. Off everything, and just enjoyed time at home with family and friends. From February to March I ran a maximum of 60 minutes per day, enjoying short runs, speed, sand dunes, walking, and supporting at The Coastal Challenge in Costa Rica and the Shotover Moonlight Mountain Marathon in New Zealand. I re-focused on basic core strength, breathing, yoga and stand-up paddleboarding. In April I slowly increased my running time to 2 to 2.5 hours every third to fourth day, powerhiking and running my way through the Buffalo Stampede SkyMarathon in Australia for a confidence-boosting win. It was time for my road trip to begin. A week in Singapore with the Peaks Foundation, a week in Annecy, France to polish off my New Zealand Limited Edition running clothing range with the support of Salomon and finally to La Palma for my Transvulcania preparation. I had a really solid two weeks of training, getting in 5 to 7 hours per day of running, biking, swimming, yoga, and walking, which solidified my confidence, health, and happiness that I had come this far. So now we get to the start. It is chaotic and dark. It is so nice to greet all my friends after so long away from the start line. The music blares, the countdown is done, and we are sprinting up for 100 meters. And then we are walking. People are tired already from the instant steepness and black, marble-like sand, the bottleneck onto the narrow track, tumbling rocks and people. I don’t realise that one of those people is Emelie until later. As the track widens and flattens, people finally get into a rhythm. Finding a pack to run with or chase. I finally find Emelie and see she is bleeding but a quick chat and I understand she is okay, but obviously not, and I only find this out at 40k. I enjoy this running, on black sand. It takes me back to training at home with the triathlon team, running up and down the white, soft dunes, doing drills to find inner strength for power endurance. I know I am moving quickly and I am feeling good. I am focused on getting through the Los Canarios aid station mayhem and into the long climb to the summit. Like always, the street is lined with people in their pyjamas banging pots and pans together. This is the extreme of this course that exists throughout. And then there is a silence. Turning onto the track that leads into the night and pine forest, only the howl of the wind is there to greet and cool us. I know each and every tree, rock, shape; I could turn my light off and still find my way. This is extremely comforting, and now I just need to focus on my body and mind. I am wondering where Emelie is, where the other girls are. And then out of the clouds rises the bright red sun. It gives the blackness warmth and a few moments of changed focus. By the time I reach the high point before El Pilar the sun is high and hot, the wind is blowing hard into my face, and I open my arms and welcome the coolness with a holler of joy. Already I can hear the crowd of El Pilar aid station. My climbing is effective today, so I find a consistent pace that I use to get to the top of the mountain in good time. As I start gaining altitude I also gain a fatigue deep in the muscles and lungs, and I have cramps in my stomach. But the views keep spirits high; I can see the summit within hands reach but I know it is still at least 10k away. It plays with my mind, but no time to think as these rocks underfoot are seeking all the attention to them. It is wonderful to see my teammates out there supporting and giving confidence with just a few special words of encouragement. 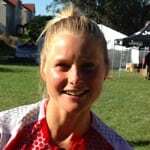 It isn’t until I see fellow Kiwi mountain runner Jono Wyatt flying along the course to cheer me on that I am told Emelie has stopped–and is headed to hospital to clean up a deep cut in her hand. Now with a job to do for both of us, I look up to face the challenge and move. Light, easy, and I therefore hope fast. Finally I reach the top; I am not wasting any time. During training I made sure to appreciate this place while I had time because during the race, this is where I need all my extra strength for my weakness–the downhill. I find a pack of guys and we silently charge down together, all taking extremely close calls as the black rock jumps up and bites at our toes. Halfway down and I am cramping bad in my stomach and now back. It is getting hot, breathless, the pain is setting into my legs. Here is the fine line. To push that little bit more knowing you are being chased or save some energy to keep on your feet. I choose to keep on my feet. I really slow but feel I am managing myself better. The torture arrives. Black tarmac, steaming hot, verging on 45 degrees Celsius, down, harder than hard. Thankfully I can hear the Tazacorte Puerto and it surges me forward down through this black hole. The zigzags arrive and so do the crew of Chiquitos shouting in their best English, “Faster Anna,” “Let’s go, Anna,” “Run Anna.” If I could I would give them all a high five now, but I leave them behind in the banks of people greeting me on the beachfront. I now have one focus only: to run the fastest 5k I can. Watered and sugared, I leave the Puerto all too aware that Maite Elizondo is chasing me six minutes back and also of how easy that six minutes could be to catch up if I have a desperate bonk at this stage! The dry river bed makes for a nice change, the high walls giving a blinker-like effect. The final climb that I had memorised in 2012 stays the same and each step I am closer to this dream coming true. Onto the final straight, at least 1k of straight, feeling like 10 miles of straight, I keep composed but I have to dig incredibly deep. Forcing some “Gracias” out to the screaming fans of this incredible event. Unaware of the time, I absorb the gratefulness, the high fives, the smiles, the gratitude of all. As I come close, the screams reach new levels. I look up to the official timing clock and see why. I am within the record time; all I need to do is let the crowd’s energy move me. The finish line. The fist pump (that I later saw Luis Alberto also gave) shows a feeling of reward and relief. Of deep sacrifice and fulfillment. It is a big YES! The kisses are for the belief, support, and encouragement from everyone throughout my ups and downs. The smiles for pure joy of experiencing this day. As I said before the race, I felt like I had already won knowing I was going to stand on the start line. I stood there with a winning smile. With more than 1,000 other winners. We started the same race; we gave it our all. Some of us finished, others didn’t. There was no failure. We all achieved something. Whether it was new boundaries, new challenges, new places, and new friends. Maybe we will be back? Maybe we will try something else? But we all tried. We become united in a wonderful world of trail running. Wonderful report Anna. Glad to see you're back! Congrats on an incredible win and return to racing! But I've gotta ask…. 3.5 gels and 1.5 energy bars for 50 miles? That's it? ?